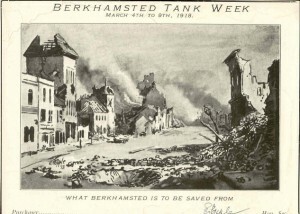 A propaganda postcard showing what Berkhamsted might have become were the resistance not upkept. Founded in 1541 by Dean Incent, Berkhamsted School enjoys a prestigious history. It is located in the west of Hertfordshire, northeast of London. The school suffered greatly in World War I, losing 235 pupils. In this site, you can find information about Berkhamsted School during the War. Email any of this Web Site’s creators, allowing you to contribute information you know that may help us and enabling you to ask questions about Berkhamsted during the Great War. Please also feel free to contact us if you find errors as you are browsing.